PHOTOGRAPHY, VISUAL ARTSouthern Glossary November 11, 2016 "Being an artist is a lifelong affair and like any relationship (even a lovely one that is going well) sometimes needs work." Ashley Kauschinger is a photographer and book artist that explores female identity and contemporary women’s voices. She is also the Founding Editor of Light Leaked, an online photography magazine that creates dialogue and community. Ashley lives and works in Columbia, SC where she's an adjunct professor at the University of South Carolina. Since I started photography I’ve experimented with a lot of different ways of working. About seven years ago I was introduced to large format photography, and it felt very natural to me. I love the experience of looking through the ground glass and how you have to stand next to the camera and not behind it. I love that I have to work on a tripod and can feel free to walk around a space, really look, and take my time. I think it’s the best way to make portraits and narrative images. Something that I find interesting about photography is that part of the self becomes part of an image. Another artist and I could have the same equipment, subject, light, and space, and what we make would come out differently. The heart of the artist melts into it all somehow. This is something I don’t think I purposefully manifested. The more you work the more it happens…that idiosyncrasy. My family, friends, and peers. Also: Julie Margaret Cameron, Sally Mann, Tracey Baran, Taryn Simon, Sophie Calle, Judy Chicago, Caravaggio, Rodin, Joseph Campbell, Sharon Olds, and Mary Oliver. Water, patches of light, forests, my backyard, my family home, my friends’ homes, antique markets, the drive-in movies, my journal. It depends on the day. Sometimes I get caught up in my head with negative mind chatter, procrastinate, don’t believe in myself, or get “busy” with other things. I’ve developed some strategies to get myself back on track and stay inspired. One of my favorites is enlisting a friend/fellow artist. Someone in your community (preferably who lives near you) that you trust and respect. Make accountability meetings with this person. Share a schedule, timeline, and artistic goals with one another and hold each other accountable for making art. This also has the bonus effect of having someone to talk out your ideas with and get feedback on your work without having to make it public through reviews or crit groups. I also like doing mini collaborations. Earlier this year, a friend and I did a photo challenge where each day we gave each other a prompt to create one image about for a month that ended up as a little zine. This isn’t earth-shattering work here; it’s an exercise in creation and (if you can believe it) fun. It also works for me to engage in something that doesn’t have expectations. I’ll write a story, poem or song. 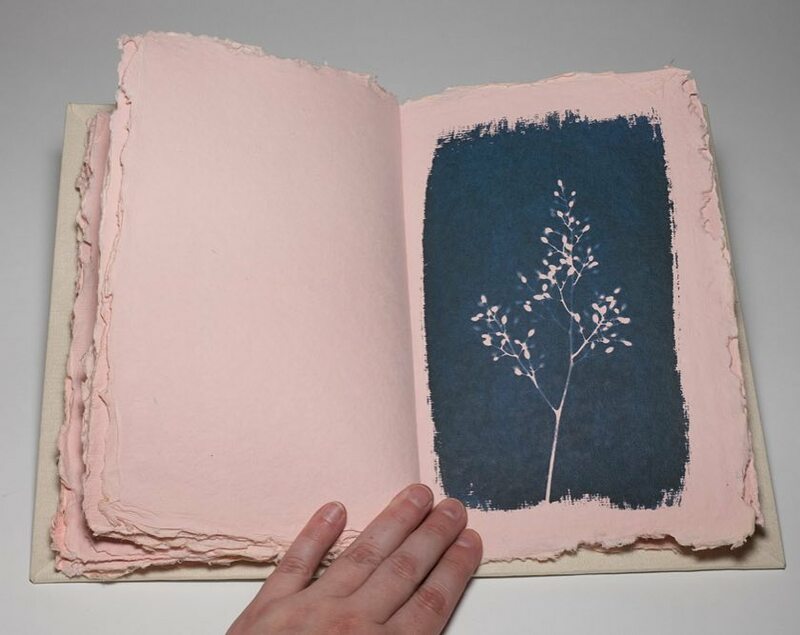 I’ll make some cyanotypes in my backyard and stitch them into a book for the joy of creating something. I’ll order a bunch of banged up $1 photo books on Amazon and spend a morning looking through them. To me, being an artist is a lifelong affair, and like any relationship (even a lovely one that is going well) sometimes needs work. For the last four years or so, I have run an online photography magazine called Light Leaked. We recently transitioned to a new format in which bi-monthly there is a themed issue. This month’s issue, America, will be published on Saturday November 12 on the website. There will be an exhibition juried by Roger May, a book review, and features of work. Personally, I have been working on a new body of work called In Her Own Right since the summer. I will be releasing the project this month, so look out! I also just had an exhibition at The Light Factory in Charlotte, NC. I shared a few installation images of it this week on Southern Glossary. Such a wonderful space, and run by the most amazing women. PHOTOGRAPHYSouthern Glossary November 17, 2016 "I feel the need to preserve these temporary things that will eventually be demolished and forgotten"
PHOTOGRAPHYSouthern Glossary November 03, 2016 "I need to spend quite a bit of time in new places connecting before I’m able to make good work."